kt literary » Blog Archive » Diversity Success Story! 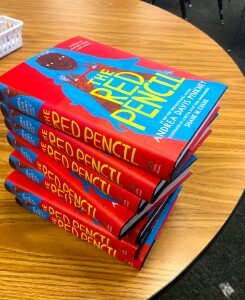 She chose THE RED PENCIL so 10 copies were delivered to the classroom last week. There is just enough time in the school year to add this title to the curriculum for 4th grade – I can’t wait to hear what the kids think! A few lessons here. Diversity is alive and vibrant and important! Teachers are thinking about diversity and there are amazing, wonderful, thoughtful, beautifully-crafted books to recommend. The We Need Diverse Books campaign is working! The school year is rapidly approaching its close. Consider donating books or bookstore gift certificates to your kids’ classrooms and libraries. Remember to support local! My books were purchased at The Bookies – a legendary Denver children’s bookstore. Ask the teacher, “what do you need” and don’t be afraid to bring in a list of recommended titles to meet their requirements. If anyone wants to donate books to my son’s classroom, tweet me @SaraMegibow – or consider donating to your own neighborhood school. Cheers all around to a Diversity Success Story! ← More great news for Krista! LOVE this story! The greatest hope we have for the world begins with children. Loved The Red Pencil. What a wonderful idea. As a teacher I spent hundreds of dollars buying books for my classroom. Would have welcomed something what you have done.